Receive the latest report as soon as it is published by becoming a Friend of Fair Isle. Friends of Fair Isle have provided much needed support to the Observatory over the 50 years since it was first established by George Waterston, particularly during the construction of the new Observatory building. The subscription rate for new Friends is £15.00 per year (£20.00 for overseas members)*. 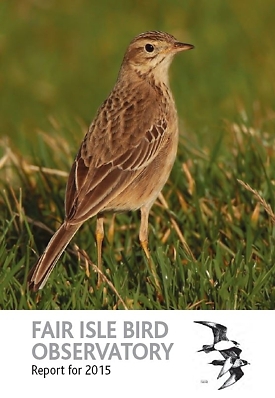 This entitles members to two newsletters and a copy of the Fair Isle Bird Observatory report each year, preferential booking of accommodation at the Observatory from the year after first joining and access to discounts. Membership renewal falls due on or around the 1st April each year. As a charity, FIBOT does everything it can to minimise administration costs. You can help by paying your annual subscription through your bank. The Bankers Order, if completed, will instruct your bank to pay the £15.00 (£20.00 for overseas) automatically on the date completed and each April 1st thereafter. It can of course be cancelled at any time. Completed Bankers Orders should be returned to the Administrator who will process your membership and then forward the Order to your bank. Friends who pay UK Income Tax can greatly increase the value of their annual subscription by covenanting them. Simply complete the Gift Aid Declaration and return this along with your completed subscription form or Banker's Order to the Administrator. This will allow FIBOT, a recognised charity, to reclaim the Income Tax that you have paid on your annual subscription. The covenant is automatically cancelled if you cease to be a Friend. * Please note that on 1st January 2020 the rate for all members will increase to £20.00 per year (£25.00 for overseas members). Friends of Fair Isle receive a bi-annual newsletter.